• Varitone is a graduated background panel printed on flame-retardant vinyl. • A wonderful non-glare vertical oriented surface without reflections. • Varitone is made in 10 vari-colors for and two sizes for perfect product photography. • Color can vary on-line due to differences in monitors. 42" wide x 62" long (1.1m x 1.6m) Vinyl, $69.00ea. 31" wide x 43" long (78.7cm x 1.1m) Vinyl, $49.00ea. 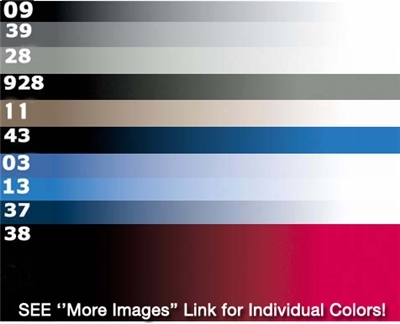 SEE the following colors under ''MORE IMAGES'' above. Graduated color photo background for photographing 3 dimensional objects. Used for selling items on-line like, sculptures, artwork, jewelry, parts for catalogs. Non-glare material that adds depth to your photo images. Available in 10 different var-colors.